We are most fortunate to find in the 1JJ Swiss Tarot deck, a Fool who is, him-self, the cypher and key to the theme of the deck. Because this Fool shows us his hand, one need look no further than this first card, which stands just outside the deck, at its edge, at the very beginning. This is the usual place of the Fool, and the appropriate place for the Tarot Fool, who, because he is before the beginning of everything, most frequently appears as the first card of the Major Arcana, and is so designated by the numeral Zero. Although The Fool is sometimes shown as unnumbered, or as the twenty-second card at the end of the atouts or ‘trumps’, his placement before the beginning is his true and rightful place. For it is he, or occasionally she, who stands at the precipice ready to lead us through the magical journey of the Tarot if we are willing to take the leap. The job of the Fool is to get right up into your face and stay there until you get it; hitting you over the head with his bauble, if necessary. This Tarot Fool has left a long trail of single-themed clues for us to find in his card, knowing that the cumu-lative effect would get through (eventually). And yet, hundreds of years have passed and, as far as we can ascertain, no one has ever deciphered the cyphers hiding in plain sight on the card of the 1JJ Swiss Tarot Fool, at least not in print. The 1JJ Swiss Tarot, which is at least “several centuries” old, (4) is purported to be “based on 14th century illustrations.” (5) Although its first date of publication is unknown, a JJ Swiss Tarot deck published in 1680 by one Ioannes Pelagius Mayer of Konstanz, whose initials, ‘IM’, are imprinted on the shield at the center of the Four of Coins card, is the earliest deck of this type that has survived. (6) Whatever its actual date of beginning, this deck has a very authentic Pagan feel to it. Oak leaves and branches, acorns and holly leaves, predominate in many of the cards’ designs in both the Major and Minor Arcana suits. They are clews dropped here and there along the path of the Tarot journey, to remind us that it is the oak whose door swings open at the summer’s turning of the year to admit the Holly King of the winter season. (7) And it is the continuous turning of the seasons that is the underlying theme of this deck, and that of many others. The oaken strands serve, also, as iconographic embellishments to the double J s in the deck’s title, whose letters are presumed by all to stand for Junon (Juno) and her consort Jupiter, the God of the Oak. Stuart R. Kaplan, the author of the voluminous The Encyclopedia of Tarot, tells us that the presence of these two ancient deities in the early 18th century decks of southern France was the result of “a conciliatory gesture toward the Church,” their inclusion being a substitution for the usual appearance of the cards known as The Pope and The Popess. (8) How-ever that may be with respect to other decks of that only slightly later period, it would seem not to be the case with this particular deck, whose preference for things Pagan trumps any concern for the Church’s feelings. In the 1JJ Swiss Tarot, Jupiter is not just one of the cards in the Major Arcana, he is one of its two main protagonists. We have no doubt that the presence of Jupiter and Juno gave rise to the presump-tion that the paired J s in the title stood for these illustrious deities. This would have been the intent of a cardmaker who did not wish the esoteric secrets con-tained in these cards to be known to all. In fact, the first J does, indeed, stand for Jupiter, but not for the reasons one might suppose. As for Juno being the deity for whom the second J in the title of this deck stands, she is as invisible as the dark phase of the moon over which she rules. Her image is included in this heliocentric deck only because she is the wife of the all-powerful God of the Oak. But her inclusion ends there. Except for a few minor symbolic elements, her presence is not felt, nor would it be of particular relevance within the context of this Tarot deck’s solar focus. As proof of the defiant, “devil may care” attitude of this 1JJ Swiss Tarot, we have the brazen Fool himself virtually thumbing his nose at the authority of the Church. The unnumbered card in this deck, which is titled Le Mat (‘The Mad-man’), whom some call ‘Le Fou’, and others, ‘The Fool’, (11) and which we shall presume, therefore, to be Zero, announces to the world in no uncertain terms that this is an entirely Pagan pack. There is nothing Christian about it at all. Le Mat, our “madman” Fool, is shown dancing towards the left, which is to say, in a widdershins, or counter-sunwise, direction. His left leg remains firmly planted on the ground. His right, which is clothed in a red pantaloon emblazoned with a stripe of stylized holly leaves running down the entire length of the seam, crosses over the left, thus creating an emphatic counter-clockwise movement. From the direction of his dance alone, we are able to ascertain that he is the Holly King, or to be more accurate, we should say that he is the surrogate for this King of Winter who stands opposed to the Jupiterian Oak King, or King of Summer, in the calendar of the Pagan year. There is no question, however, that even if our Tarot Fool were to be stripped of his holly-festooned costume, we could be absolutely certain of his Pagan associ-ation with winter and the waning half of the year because of the widdershins direction of his dance. He dances against the light. And this is the very definition of widdershins, for aside from its meaning as a movement towards a left, or ‘sinister’, counter-sunwise direction, “in certain circumstances it can be used to refer to a direction which is against the light . . . where you are unable to see your shadow.” (14) There is nothing sinister about The Fool’s dance; he is merely performing what we might call the winter sequence of the annual procession of the sun across the sky. This Holy Fool of Winter is singularly unimpressed by the dictates of the Church. They are of no concern to him whatsoever. With eyes wide open, he gazes upon us full face, inviting us to join the dance. In his right hand he holds one of the hall-marks of the magician, a magic wand carved from the wood of a sacred tree for use in the casting of spells. We would venture an educated guess that our holly-mad Tarot Fool displays a wand cut from a branch of the holly. To imagine him possessing any other wood as his own would be foolhardy. And possess it he does, for his emphatically firm grip at the center of the holy wand makes it clear that this is his very personal instrument of power. In the single example of the Battle of Winter and Summer, or of Holly vs. Oak, that we here cite, the 14th century alliterative verse of Sir Gawain and the Green Knight, man and nature exist in an inseparable unity. The huge man who “green all over glowed . . . both garments and man,” (28) is a tree (and a fairy) who walks and talks. As we have noted, the illustrations on which this Tarot deck is thought to be based are of this same period. (29) We should not, then, be too surprised to find the perennial dance of the opposing seasons as its opening theme. But the dance is just the beginning. In the likely event that we may have missed the significance of its left-handed motion, our Tarot Fool proffers another clue in the cryptic gesture of his left hand. With palm facing out so all the world can see, his upraised thumb, forefinger, and little finger sign a message in a secret speech intelligible to anyone who can read it. The arcane mystery of its meaning is pro-tected by a veil of secrecy from anyone not in possession of the key to its code. In our search for that key, we encountered several possibilities that were considered and then quickly discarded as unsuitable solutions. Before we began our search in earnest, we had already rejected the throwaway line by Stuart Kaplan who, describ-ing the same gesture in a later “Double J Tarot” deck by another cardmaker, said that Le Fou (The Fool) was “making a sign of mockery” with his left hand. (30) Among the more serious considerations there were two, which we share so that the first can be laid to rest by interpreters of the Tarot, and the second, used only as a secondary means of amplification rather than a solution to the message. In the first instance, it has been said that the enigmatic position of the hand of The Fool appears to be a variant of the famous gesture made to avert the ‘Evil Eye’, the mano cornuta, or ‘horned hand’, most often thought to represent the horns of the bull. But the mano cornuta makes no sense within the symbolic context of the Tarot itself. Our doubts were confirmed by Frederick Thomas Elworthy, the definitive authority on the use of gestures of the hand as amuletic devices against the Evil Eye, who offers an exacting description of what, precisely, constitutes the ‘horned hand’. It is made, he says, in one way only: with “the index and little finger extended, the middle and ring finger clasped by the thumb.” (31) The posit-ioning of our Fool’s prominently outstretched thumb is nowhere to be seen in this requisite position. There is an overall consistency in the way schematic archetypal systems play out across diverse disciplines. Our interest was peaked by the attribution of the fore-finger to Jupiter, not only because the ‘Jupiter finger’ is raised in The Fool’s hand, but because Jupiter, the King, is the subject of our Tarot deck. Addition-ally, we discovered that another name for the ‘Saturn finger’ is “the Fool’s-finger”. (34) This was, to be sure, another of The Fool’s very enticing clues, but it was by no means the solution to his message. We would have to wait until we could put all of the pieces of the puzzle together before we could come to an understanding of the full implication of these fascinatingly identified fingers as they applied to our Tarot Fool’s hand. At least we knew that we were on the right track. Then we chanced upon a now much-reproduced drawing in Robert Graves’s The White Goddess: A Historical Grammar of Poetic Myth. 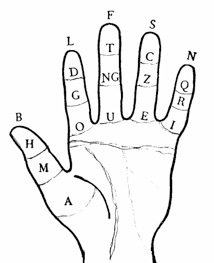 (35) It is an image of a left hand on which an unintelligible alphabet is laid out on each of the fingers and the thumb. The alphabet that Graves has superimposed on the hand, is that of a long-forgotten sacred language of the Druidic bards known as Ogham (pro-nounced ohm, (36) the ‘a’ being not quite heard, but subliminally audible, never-theless). There it was. Everything clicked. This was the key to the seemingly impenetrable open secret that is literally spelled out in The Fool’s left hand. We had first to digest the startling revelation that The Fool of our Tarot deck was a Druid. This is not such an odd overlay as one might think. In point of fact, the historical background shows them to be a perfect confluence of char-acters. The disdain of the Druids for the new Church was rivaled only by the Christian hatred of the Druids, whose arcane wisdom was anathema to the doctrines of the Church. The Christian diatribes against the Druids often took the form of ruthless and puerile ridicule, (38) qualities that we associate with the archetypal Fool himself. The formerly honored Druids were ridiculed to such an extent that, not only were their finely-honed skills trampled upon and defiled, but by the time the Christians were done with them, their very existence had even been called into question. (39) They are, to this day, not a subject to be brought up in casual conversation unless one wishes to incur peals of laughter. [, meaning] ‘buffoon’.” (40) The usual translation of the word druth, which is rendered interchangeably as “‘fool’ or ‘madman’ (in the sense of inspired mad-ness or inspiration),” (41) is a seamless match to the Druid-Fool in our Tarot deck, whose title, Le Mat, has the identical and indistinguishable meaning of ‘fool’ and ‘madman’. Given the context of these warring faiths, we might ask whether there is not an oblique reference to the Christian insult – a slap in the Church’s face, if you will, on the part of the Druid who has the last laugh by parading as The Fool, all the while divulging his wisdom to the world. His message has gotten through the enemy lines. We wish to join him in silencing any trace of laughter that may be lingering in the air, by setting the record straight as to the what the Druids knew. We could sum up what they knew in one word. Everything! At least everything of consequence. One would be hard-pressed to find a course of study superior in quality to the exceptionally rigorous program that was undertaken by a young Druid, one which was occasionally open to girls as well as boys. (42) The exhaus-tive Bardic curriculum spanned a grueling twelve-year minimum period of study, the particulars of which are beyond impressive, especially in view of the fact that the teachings were transmitted orally. Nothing was written down. the term file, which is a more specific qualification meaning ‘poet’, or ‘bard’, ‘judge’ or ‘legal advocate’. We make no such distinction, preferring to use these appellations indiscriminately and interchangeably. The lines are somewhat blurred to begin with, and this is so because, in actuality, they seem to coexist within the same person. But, we must be somewhat more specific about the word file, the meaning of which sheds some light on the relationship of king, or some-times queen, and Druid. rate equivalent: the file was much more magical than literary in his duties. his business to exercise on behalf of the king whom he nominally served. What we know of the Druidic language and its numerous Ogham alphabets is recorded in some great detail in the Medieval Irish Book of Ballymote, which was assembled in 1391. The book is a collection of texts, which are transcriptions from much older manuscripts that set forth the rules pertaining to the use of some one-hundred-fifty variations of the prime alphabet known as Beth-Luis-Nion, or ‘B-L-N’. (51) The most well-known of the numerous alphabetic variants, which was its original form, (52) is that which is commonly referred to as the “alphabet of trees.” (53) It is so called, not for its “branch-like” letter forms, as some have suggested, (54) but because each of its letters actually stands for a tree or a bush or shrub. In view of the fact that the literal meaning of the word Druid is ‘Wise in the Way of Trees’, (55) we should not be surprised in the least to find that an arboreal alphabet serves as the Druids’s central means of communication. A cursory in-spection of any ancient magical alphabet will reveal that it is a vast repository of esoteric wisdom. (56) The “primarily magical” alphabet of the Druids (57) is no exception. The whole mystery of the world is to be found therein. In doing so, a kind of resonance is created in the sounding of the words which has a very musical ring to it. On the surface, this harmonic after-effect acts as an ingenious aid in the memorization of language, but in the language of the sacred, there is always a hidden and higher purpose. According to the ancient Vedic texts of India, the creation of the world is attributed to the intonation of “the one profound and all-embracing vibration of the sacred sound OM,” (73) which existed before the beginning. This is what is meant by the “hearing” of the Vedas, during the recitation of which, the whole world comes alive in the resonating intonations of the one sound. (74) Undoubtedly, the poetically in-spired Druid experienced the singing of the trees in the reciting of the ancient verses in the same way as the Rishis heard the sacred word. The tenacious insistence upon the transmission of sacred teachings by oral means, even long after the ability to commit such teachings to writing has occurred and, regardless of whether those teachings take the form of ritual belief or sacred story, is widespread and well-known. The oral tradition is highly resistant to change, not only for reasons having to do with a refusal to interfere with the intrinsic order of ritualistic patterns, but because the writing down of these things changes everything, often acting to spell the doom of the very thing that such recording purports to preserve. The original single-row of notched runic-like markings, which were drawn below, above, diagonally through, and straight through a horizontal line, were abandoned – much to the dismay of the Druids – when the alphabet was first set down in written word-form. The markings were now laid out as letters within a framework of four rows with five letters in each row, such as we have shown above. The closely-held secrets of the nondescript notched lines were thus revealed to show the letter for which each immediately identifiable tree or bush stood. to five, irresistibly suggests the hand and its fingers. All these letters . . . Using Graves’s “score”, we can visualize the relationship of the Ogham letters to the hand of our Tarot Fool who has, however, simplified both scholars’ theories by eliminating the need to point. He merely holds up the fingers that point the way to his message. “Reading” the letters indicated by his upraised thumb, forefinger, and little finger, we are presented with some fascinating possibilities. To begin with, given the certainly not coincidental fact that the first three letters that crop up on the very tips of these three digits are B, L, and N, we would be complete fools’ asses not to recognize that the Druid masquerading as The Fool is making a blatant announcement of exactly who he is by proclaiming his knowledge of the secret Ogham alphabet of Beth-Luis-Nion, or ‘B-L-N’. The joints of the fingers, which contain the remaining consonantal letters, some of which have a direct bearing on his shorthand message, we will take up momentarily. But, for now, we move down the hand to the all-important vowels located at the bases of the fingers, where a most substantive message is to be found. It should be obvious to any scholar of the sacred, whether a Druid, or not, that the vowels would probably contain the deepest meaning, for they are the most sacred elements of sacred language. This is why the vowels are never written or pronounced in Hebrew, and why vowels are set apart, or sanctified, in many other ancient languages. a leap into the precipice, if you will, in order to decipher the multi-layered meanings of the letters themselves. To do so, we must rely, once more, on the wisdom of our modern poet, Robert Graves, who, in his quest to solve the sacred riddles of the ancient bards, has fitted-out the language of the trees into a calendar of the seasons. He accomplished this extraordinarily difficult task by carefully threading his way through the intricacies of the numerous mythological nuances of each of the Ogham trees, and then weaving their seasons into a calendrical whole that corresponded to the sacred period of a ‘year and a day’. 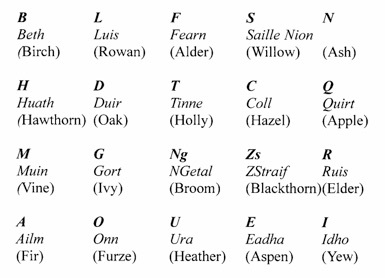 The five vowel-trees of A-O-U-E-I stand on their own in Graves’s “calendar of seasonal tree-magic”, as they were originally intended to do when the sacred Ogham alphabet was devised. (103) Whereas, the consonants spell out the story of the year in some great detail, the vowels sum up the essence of the whole in a kind of abbreviated, but intense, shorthand. The sacred vowels are complete in themselves as arboreal equivalences, and perhaps also as sound equivalen-ces, of the stations of the solar year. We begin the decipherment of all that is contained in The Fool’s hand, of both the message that is spelled out in the A-O-I cypher of his upraised fingers, and of the hidden contribution to the whole meaning of that message, which is made by the fingers that he holds down. The five vowels are here presented in their proper A-O-U-E-I sequence. We will note also, where relevant, how the planetary rulers of the fingers play a hand in the scheme of things. One has the impression from the instances of its many appearances in litera-ture, that the extra day exists in a timeless zone somewhere between the end and the beginning, but it is here nailed down with pinpoint accuracy in real time. Like the Tarot Fool himself, this extra day is really before the begin-ning, the next day being the real first day of the year, and so, we must ascribe the very same attributes to the mythical day as we have to The Fool. It is really the Zero of the calendar. But Graves calls this nowhere day “the first day of the year,” (109) and assigns to it the first Ogham vowel, A (AILM) (Silver Fir). (110) The equivalent first consonant, B, or Beth (Birch), stands for the first “real” day of the year. One thoroughly Pagan custom of the winter season which did not get taken over by the Church, although it did find its way, with great dignity and respect, into the Cathedral at York, and other lesser parishes, was the British Druids’s much disputed New Year ritual of laying on the high altar the sacred plant commonly known as ‘All-heal’ or mistletoe. (114) At the very moment of its bearing fruit, this especially sacred plant seems to have been the focus of a very public rite, a rite which both honored the old half of the year, and cele-brated the birth of the new. The symbolic marriage of the sacred mistletoe and oak found a place in the hearts of lovers, which is why we find it during the Christmas/New Year’s season hanging from the lintels of doorways, where, under its magical luminescent presence, kisses are exchanged, either by choice or by accident. By some strange merging of universes, the corresponding place on the hand for the sacred vowel of the extra day is at the base of the thumb, which is ruled by Venus, the Goddess of Love, who will take you to that floating indefinable day faster than you can think. Another day of beginnings, the absolute zero point of the year, is acknowl-edged in the tree alphabet-calendar by the second vowel O (ONN) (Furze). (122) This day, which is shown at the base of the forefinger, marks the Vernal Equinox of Spring, generally falling on or about March 21st. It is the first of the four cardinal points of the year, marking the exact point at which the sun rises exactly due East at zero degrees, zero minutes, zero seconds in the con-stellation of Aries. The Vernal Equinox (‘equal night’) is the exact point at which the sun crosses the celestial equator in spring, making the hours of daylight and those of dark-ness exactly equal. This day lies at the absolute center between the solstices of winter and summer. Immediately following this equinoctial event, the spi-raling shadow of the sun appears to straighten, and then cross over, altering its motion from a counter-clockwise winter direction to a “right-handwise”, (124) or clock-wise, summer direction. This equinox of spring thus marks the beginning of the summer trajectory which will culminate at the Summer Solstice of June. This apparent movement of the sun is the opposite of what we have described in tracing the winter path of The Fool’s dance. In palmistry, the forefinger denotes Jupiter. Thus, it has come to be called the ‘Jupiter Finger’. This is the finger of authority and power, the finger with which we point, and that which we use to make declarations and pronounce-ments, or accusations and scoldings, more effective. In the astrology of the ancient world, the planet of expansive beneficent plenty and joviality was always named for the king of the gods. We still call that planet ‘Jupiter’, after the most powerful god of the Roman pantheon, Iuppiter, or Jupiter, the god to whom the oak tree was sacred. Such consistency of meaning extends, also, to the Ogham hand, where we find the place of Jupiter’s mighty oak, as signified by the letter D (Duir), ‘Oak’, located at the first joint of the fore-finger. In the course of our inquiries, we chanced upon a most fascinating image of a Fool in the likeness our own Fool, who, with a single forefinger, pointed to the devolution over time of the 1JJ Swiss Tarot deck. In a deck published between 1885-1887, of essentially the same design as the Double J Tarots, Le Mat is shown holding “a spiked club” in his right hand, while the left hand, in the manner of our Fool’s gesture, displays but one finger. (125) Of course, you guessed the wrong finger! The one that is held high is the powerful Jupiter-finger, which, in the company of a sacred wand that has morphed into an instrument of brutality, speaks loudly enough. The final blow is delivered with this deck’s removal of the Jupiter and Juno cards, which have been replaced by the original figures of The Pope and The Popess. The good news is that this rogue deck, unlike our own, has not been reprinted. But on this day of foolery and mayhem, The Fool’s middle ‘Fool-finger’ is nowhere to be seen. There is no need for him to hold this finger aloft. He himself stands for this day. For in the seamless pattern of symbolic sacred meaning, we find the Ogham letter Tinne (T) ‘Holly’, located at the first joint of the middle finger of the hand, standing for the Holly King. (129) He parades before us, very full of himself, strewn with holly leaves. He has just killed the Oak King. (130) The Holly King reigns now. But not for long. The king’s wheel is always turning, and in this month of June, when the sun reaches its most intense peak of illumination on the longest day of the year, Jupiter’s reign comes to an end. Because the word Duir means both ‘oak’ and ‘door’, (131) June is known as the ‘Month of the Door’ as well as the ‘Month of the Oak’. The June solstice is the ‘Door of the Year’ through which the Oak King, in all his flowering abundance, passes, standing aside for his twin and successor, the Holly King. This transfer of power is such a natural progression of events that, as scholars of the Ogham alphabet have remarked, the letters D (Duir) for Oak, and T (Tinne) for Holly “were originally more or less interchangeable.” (132) And so, the Holly King, in turn, will meet his death when the light begins to grow and the Oak King, once again, resumes his place of power as ruler of the waxing year. Theirs is the perennial Battle of Winter and Summer, which will continue until the end of time. The Autumnal, or Fall Equinox, which is the complement to the Vernal Equinox, occurs on the opposite side of the year, on or about the 21st of September. This equinox (‘equal night’) marks the exact point at which the sun crosses the celestial equator in the fall, thus making the hours of daylight and those of darkness exactly equal on this day which lies at the absolute center between the solstices of summer and winter. Immediately following this equinoctial event, the spiraling shadow of the sun again appears to straighten, and then cross over, altering its apparent motion from a clockwise summer direction to that of the counter-clockwise winter trajectory, which will reach its lowest point at the Solstice of December. This day of seasonal change, whose place on the hand is at the base of the ring finger, is represented by E (EADHA) (Aspen), the fourth vowel of the Ogham alphabet. (133) Although the fall switching point between the solstices is not visible in the gesture of The Fool’s hand, it is precisely where the Tarot Fool finds himself dancing: in a left-handed widdershins direction, his body twisted by the force of the counter-movement. His dance is a reflection of the change that is occurring in the light. 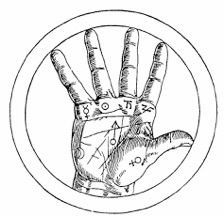 By no strange coincidence, the ring finger of the The Fool is held down, hidden, because it is the digit which represents the Sun (Apollo), whose light will now begin to wane. crated sites, the association of yew trees in churchyards was perpetuated. Virtually every part of the Yew tree is deadly poisonous, both in itself, and of its usage. Aside from its primary use in the context of funerals, the making of bows from its wood, as well as bow-staves (138) whose tips were then dipped in the poisonous juice of its berries (139) for guaranteed effect, would seem to justify its connotations with death. But this ancient evergreen tree is not only a bringer of death. It is, at the same time, a symbol of immortality. This raises the question of what particular calendar the Druid-Fool upholds in his succinct consideration of the year. Clearly, his time-keeping is regulated by the thinking of the old Celtic calendar, whose division of time is strictly split into “a fundamental duality” of opposing halves of dark and light. (142) This “alternation of opposites, [of] light and darkness, warmth and cold, life and death,” (143) comprises the essence of his schema. But in this early natural calendar, based purely upon the growing seasons, and not upon the earth-perceived position of the sun, the solstices are not the turn-ing points of the year marking the beginnings of summer and winter. In that reckoning of time, “the first of May is the Calends of summer, the first of November the Calends of winter, and these two festivals divide the year into two seasons of six months each.” (144) In the oak and holly-strewn 1JJ Swiss Tarot deck, the solstices of winter and summer, falling on or about the 21st of December and June, respectively, are the indisputable points of beginning of the two opposing seasons. The Dream is not just a faerie story, although that is exactly what it is; the archaeological record backs up much of what it has to tell us. (147) It appears to be an historical record also, as is true of so many other “myths”, for in its telling, we are meant to understand that despite a full knowledge of the ob-servable movements of the sun, the old agricultural calendar is still para-mount. This tale, which contains strong elements of Druidism, (148) is an anthropo-morphized solar myth about the life-and-death struggle of the sun at the most critical point of the year, the time of Samain. The setting for all of this is Brugh-na-Boinne, the palace of the sun-god on the River Boyne. If one were to travel the world in search of an ideal site from which to observe the apparent motions of the sun, a more perfect place than this would be hard to find. to stand still on Samain, when time itself is said not to exist. (151) Within the context of the story of his coming into being, this is an astonishing enough feat, but given the fact that the word solstice, from the Latin sol, ‘sun’, plus stit- (from the verb sistere), ‘stopped, stationary’, has the literal meaning of the ‘sun standing still’, we must pay very close attention to this accomplish-ment. In the real world, this can only happen on the solstices of winter and summer. to show where the Sun will rise in the morning after winter solstice. the Sun begins its ascent into the northern sky and days grow longer. Astronomical evidence to the contrary not withstanding, implicit in the pro-clamation that the head of the faerie tribe has caused the sun to stand still on Samain, the last day of the year, the day of the sun-god Oengus’s conception and birth, is a reaffirmation that, regardless of what happens at the solstice of winter, the most sacred day of the year shall remain, forever and always, Samain. As Christianity forced its will on the world, the Church fathers, determined to eradicate all traces of joyous Pagan pandemonium, set themselves the onerous task of rearranging the timing of the sacred Pagan festivals and the renaming of their days. (157) While denouncing the unchristian practices, they simultane-ously embraced the gist of these age-old, deeply ingrained celebrations which, if they were permitted to be observed at all, were to be celebrated with proper Christian decorum. Needless to say, this took a long time. The solstice-identified Holly Fool of our most unchristian Tarot deck is barely distinguishable from the Christian, more “traditional”, notions of what such a “foolish” character is about. His unprecedented public display of inviolable Druidic secrets, divulged under this cover, suggests one thing: that if you are a Druid in hiding, you blend in. No one had a clue. But there are some things that one can never give up, that can never be taken away, that cannot be handed over to anyone just for the asking. One of those things is the gift of prophecy. There is an interesting story about this in the Homeric Hymn to Hermes. (158) Hermes is the eternal youth who is old before his time. Within hours of his birth he knows what he wants to be when he grows up. He wants to be Apollo. What he covets most is his skill in the art of prophecy. This is a child who schemes and plots and cheats to get what he wants. And so, before the dawning of his second day, Hermes announces that if his wish is not granted by his father Zeus, he will take it by plundering the riches of Delphi, the seat of his brother Apollo’s oracular empowerment. Apollo is already exasperated with this trickster-god’s nefarious deeds, and so drags him, kicking and screaming, before the council of the gods to settle their many disputes. The Druids must have admired the inspired skills of Hermes as herald and counsel to the gods. They were much like him. And what Druid would not stand in awe of Hermes’s ability to make the footprints of the cattle he has stolen walk backwards to avoid detection of the theft? Which, it is to be noted, is accomplished before he has received the gift of the magic wand! (165) Elsewhere, it has been said that this god was “the inventor of language” and, as the word hermeneus (‘interpreter’) demonstrates, also its interpreter. (166) These, too, are attributes that would appeal to the Druids for whom the exacting precision of words was so essential. This Irish god, Ogma, or Oghma, a patron of poets who is likewise known as the ‘God of Eloquence’, “much skilled in dialects and poetry,” (171) is the inventor of the sacred language of Ogham. Mirroring his Gaulish equivalent, he is similarly the strongman and Hercules-like champion of his tribe, a warrior widely known for his masterful use of speech. But he has a gentler side than Ogmios, for he speaks with smooth, ‘Honey-Mouthed’, (172) sweet-sounding words. There is an echo here, of the baby Hermes who enchanted the sun-god Apollo with his sweet song. Of course, there is an otherworldly quality to all of this. We are, after all, between worlds, even if our feet are planted firmly on the ground. But, like the god whom the Druids worshipped above all others, these ‘Weavers of Spells’, (176) on whose word kingdoms rose or fell, lived in a permanent atmosphere of liminality, floating between the shamanic world of dream and vision and the world of earthly reality. Hermes is a traveler between worlds, a god of boundaries who knows no bounds, an ‘Escorter of Souls’, (177) and "conjurer of the spirits of the dead." (178) As Hermes Propylaios, he is the one who stands ‘Before the Gate’ that separates the world of the living from the world of the dead. This quicksilver messenger of the gods for whom the little digit is named has much to do with the last day of the dying year. He is the aggelos (‘angel’), who, as Rainer Maria Rilke, a poet’s poet who is intimately acquainted with angels, reminds us, is of an order of beings who make no distinction between the living and the dead. make the mistake of drawing too sharp distinctions. With the deciphering of the cyphers we have solved the mystery of the gesture of The Fool’s hand that announces the theme of the 1JJ Swiss Tarot deck. We now see that the signing of the thumb and little finger, signifying the first and the last of the sacred vowels, the Alpha and Omega, if you will, the alphabetic equivalent of all Beginnings and Endings, Firsts and Lasts, is a repetition and amplification of the movement of The Fool’s dance. The dance’s portrayal of the sacred mystery of the spiraling cycles of life and death visible in the annual journey of the Sun, describes the cyclical destiny of the king himself, who is but an earthly reflection of that light. The raised forefinger, which has such ancient associations with Jupiter of the Oak, is a “personification” of that king who stands between the First and the Last. Gazing upon this card, we now see that we are here in the presence of a master of the word; a poet and singer of song who, without uttering a word, quite literally sums up the essence of All and Everything in this single sacred gesture. “THE TAROT FOOL’S HAND” IS A REVISED AND EXPANDED EDITION OF A CHAPTER FROM THE AUTHOR’S UNPUBLISHED MANUSCRIPT, THE TAROT FOOL, 1988-95. 1. “Le Mat” (The Fool) of the 1JJ Swiss Tarot Deck. The artist of this deck is anonymous. The oldest of the surviving “Double J” decks was published by the cardmaker, Ioannes Pelagius Mayer, in Schaffhausen in 1680. Of the known subsequent publishing history, a later version, in which Le Mat was titled Le Fou, was published between 1831-1838 by Johann Georg Rauch, who produced another nearly identical deck in 1865. Between 1885-1887, another cardmaker issued a substantially altered deck based on the original 1JJ Swiss Tarot drawings. In no way could this be considered a “Double J” deck because, not only has Le Mat’s left hand been altered, but the Jupiter and Junon cards have been replaced with the original Pope and Popess cards. AG Muller & Cie of Schaffhausen is the cardmaker for the cards that are in use today, which is a true “Double J” deck. The copyright for the original artwork for this image has expired and is now free content in the Public Domain. The image published here is based on a similar Le Mat published in 1974 by AGMuller and distributed in the U.S. by U.S. Games Systems, Inc. However, it is not the same card as that which license is claimed by US Games Systems. Our Fool has been altered and reconfigured exclusively for this website. 2. William Shakespeare, As You Like It. III.ii. 5. 3. Cypher is an alternate spelling of cipher. This entire opening paragraph is a play on the various meanings of the word cipher found in Webster’s New World Dictionary of the American Language, College Edition. (Cleveland and New York: The World Publishing Co., 1959), p. 264. 4. S. R. Kaplan, Tarot Cards For Fun and Fortune Telling: Illustrated Guide to the Spreading and Interpretation of the popular 78-card Tarot 1JJ deck of Muller & Cie, Switzerland. (Stamford, CT: U. S. Games Systems, Inc., 1970, 25th Printing, April, 1988), p. 7. 5. Samuel Weiser Distribution Catalog 1993. (York Beach, ME. : Samuel Weiser, Inc., 1993), p. 225. 6. See: Stuart R. Kaplan, The Encyclopedia of Tarot. (Stamford, CT: U. S. Games Systems, Inc., 1978, Sixth Printing, 1988), Vol. I, Preface, p. xii. See, also, Catherine Perry Hargrave, A History of Playing Cards: And a Bibliography of Cards and Gaming. (Mineola, NY: Dover Publications, Inc., 2000, unabridged republication of 1966 Dover edition of an unabridged reprint of the original 1930 edition published by Houghton Mifflin Company, Boston), p. 262. 8. Stuart R. Kaplan, The Encyclopedia of Tarot, op. cit., Vol. I, preface, p. xii. 9. Catherine Perry Hargrave, A History of Playing Cards: And a Bibliography of Cards and Gaming, op. cit., p. 189. 10. I am indebted and deeply grateful to Dr. Lois Oppenheim, Professor and Chair of the Department of Modern Languages and Literatures at Montclair State University, Montclair, NJ, for this invaluable French connection. 12. See: A Dictionary of Plant Lore. Roy Vickery, Compiler. (Oxford: Oxford University Press Paperback, 1997), “holly”, p. 179. 13. W. Carew Hazlitt, Faiths and Folklore Of the British Isles: A Descriptive and Historical Dictionary . . . . Two Volumes. (New York: Benjamin Blom, 1965. Reprinted from the revised 1905 Edition originally issued in 1870, based on an 1813 compilation by John Brand, The Popular Antiquities Of Great Britain), “Fool (Christmas)”, Vol. I, p. 241, quoting Minshew’s Dictionary, 1617. 15. Martin Brennan, The Stars and the Stones: Ancient Art and Astronomy in Ireland. (London: Thames and Hudson, 1983), p. 190. 16. This illustration is based upon Martin Brennan’s diagram in The Stars and the Stones: Ancient Art and Astronomy in Ireland, op. cit., p. 190. 17. See: Barbara G. Walker, The Woman’s Encyclopedia of Myths and Secrets. (San Francisco: Harper & Row, Publishers, 1983), “widdershins”, p. 1076. See also, Barbara Walker’s crucially insightful remarks on the lemniscate in the Tarot deck in general, in Barbara G. Walker, The Secrets of the Tarot: Origins, History, and Symbolism. (San Francisco: Harper & Row, 1984), pp. 35-37. 20. Lewis Spence, The Magic Arts in Celtic Britain. (Mineola, NY: Dover Publications, Inc., 1999, An unabridged republication of the work as published by Rider & Co., London and New York, n.d.), p. 27, citing A. MacBain, Celtic Mythology and Religion. (Stirling, 1917), p. 81. 22. See: Robert Graves, The White Goddess: A Historical Grammar of Poetic Myth. (New York: Farrar, Straus and Giroux, 1974; 7th Printing of Amended and Enlarged Edition of 1966), pp. 176-81. 23. Sir Gawain and the Green Knight, in Sir Gawain and the Green Knight, Pearl, and Sir Orfeo. J. R. R. Tolkien, Trans. (Boston: Houghton Mifflin Co., 1975), stanza 10, line 4; stanza 10, line 6, p. 30. 24. Theodore H. Gaster, Editor’s Forward to Francis Macdonald Cornford, The Origin of Attic Comedy. Edited with Forward and Additional Notes by Theodore H. Gaster. (Garden City, NY: Anchor Books/Doubleday & Company, Inc., 1961), Foreword, Part I, p. xiv. 25. See: Theodore H. Gaster, Editor’s Forward to Francis Macdonald Cornford, The Origin of Attic Comedy, op. cit., Foreword, Part I, pp. xiv-xv, and all of F. M. Cornford’s text following. 27. Theodore H. Gaster, Editor’s Foreword to Francis Macdonald Cornford, The Origin of Attic Comedy, op. cit., Foreword, Part I, p. xiv. Gastor’s lucid Foreword (pp. xiii-xxvii) provides a brief, but impressive overview of the numerous instances of such “ritual archetypes” (p. xiv) in literature that have been postulated by a host of dedicated and revered scholars. 28. Sir Gawain and the Green Knight, in Sir Gawain and the Green Knight, Pearl, and Sir Orfeo, op. cit., stanza 7, line 20 . . . stanza 8, line 1, p. 28. 29. Samuel Weiser Distribution Catalog 1993, op. cit., p. 225. 30. Stuart R. Kaplan, The Encyclopedia of Tarot. First Printing. (New York: U. S. Games Systems, Inc., 1986), Vol. II, p. 364, illus., p. 365. According to Kaplan, this deck was published by Johann Georg Rauch sometime between 1831-1838. The author also shows another “Double J” deck published by Rauch in 1865. (Illus., Vol. II, p. 366.) Although their Fools are titled “Le Fou”, (The Fool) in lieu of Le Mat, they are nearly identical to our Fool in every other respect. 32. Sir E. A. Wallis Budge, Amulets and Talismans. (New Hyde Park, NY: University Books, 1968), p. 402; Robert Graves has given extensive interpretations of these deified fingers in his The White Goddess: A Historical Grammar of Poetic Myth, op. cit., pp. 196-198. 33. Sir E. A. Wallis Budge, Amulets and Talismans. op. cit., p. 402. Wallis Budge, who is more well-known for his tireless work on Egypt than for his profound knowledge of the occult, reproduces this illustration, which was previously presented in Cornelius Agrippa, Magische Werke, Vol. ii, chap. xxvii., p. 160, of the German translation, Berlin, 1921. The magical text was originally published by Agrippa in 1531 under the title De occulta philosophia, where this diagram first appeared. 34. Robert Graves, The White Goddess: A Historical Grammar of Poetic Myth, op. cit., p. 196. 35. Ibid., p. 115. The drawing that first appeared in the 1946 edition of The White Goddess was original to Graves. 37. The drawing that is reproduced here is an altered version of that which appears in Robert Graves, The White Goddess: A Historical Grammar of Poetic Myth, op. cit., p. 115. 38. See: R. A. S. Macalister, The Archaeology of Ireland. (New York: Arno Press: A New York Times Company, Reprint Edition, 1977. First published London, 1928; Second edition, revised and rewritten, 1949; Reissued 1972 by Benjamin Blom, Inc.), p. 343. 39. Lewis Spence, The Magic Arts in Celtic Britain, op. cit., p. 41. 40. R. A. S. Macalister, The Archaeology of Ireland, op. cit., p. 343. Macalister’s full discussion of this matter on pp. 367-68, is quite illuminating. 41. John Matthews, The Druid Source Book. John Matthews, Compiler, Editor. (London: Blandford Press, 1997), Introduction, p. 8. 42. R. A. Stewart Macalister, The Secret Languages of Ireland. (Cambridge: At the University Press, 1937), p. 11. 43. John Matthews, Taliesin: The Last Celtic Shaman. (Rochester, Vt.: Inner Traditions, 1991, 2002), pp. 121-22, citing Eugene O’Curry, Manners and Customs of the Ancient Irish. 3 Vols., Williams & Norgate, 1873, and Patrick Joyce, A Social History of Ancient Ireland. 2 Vols., Longman, Green & Co., 1903. 47. Ibid., unpaginated, p. 1. 49. While you are waiting, although there are certain points in the article with which we disagree, having to do with the use of finger joints rather that tips of the fingers for mantic inspiration, see an illuminating discussion of these arts by shamanic practitioner, Caitlin Matthews, “The Celtic Art of Divination”, which is a section in Chapter 8, “Prophecy and Divination”, in Caitlin and John Matthews, The Encyclopedia of Celtic Wisdom: A Celtic Shaman’s Sourcebook. (Rockport, MA: Element Books, Inc., 1994), pp. 240-253. 50. R. A. Stewart Macalister, The Secret Languages of Ireland, op. cit., p. 11. This is a relatively inaccessible book, whose entire first chapter is devoted to Ogham, pp. 1-36. John Matthews has reprinted this chapter in its entirety in his invaluable The Celtic Seers’ Source Book: Vision and Magic in the Druid Tradition. Edited and Selected by John Matthews. (London: Blandford, 1999), pp. 198-220. All quotations cited in the present article are from the original publication of 1937. 52. Robert Graves, The White Goddess: A Historical Grammar of Poetic Myth, op. cit., p. 200. 53. R. A. S. Macalister, The Archaeology of Ireland, op. cit., p. 333. 56. See: Nigel Pennick, Magical Alphabets. (York Beach, ME: Samuel Weiser, Inc., 1993), passim. 57. R. A. S. Macalister, The Archaeology of Ireland, op. cit., p. 337. 59. For a very informative discussion of the sounds of the planets’ orbits, see: Hans Cousto, The Cosmic Octave: Origin of Harmony. Translated by Christopher Baker and Judith Harrison. (Mendocino, CA. : LifeRhythm, 1988. 61. See: James MacKillop, Dictionary of Celtic Mythology. (Oxford, Oxford University Press, 1998), “ogham”, p. 310, citing Sean O’Boyle, Ogam: The Poets’ Secret. (Dublin: Gilbert Dalton, Ltd., 1980). Sean O’Boyle’s (1908-1979) much sought-after book was published posthumously, and has been long out-of-print. See also: “Cryptic Varieties”: No. 1 Aradach Fionn/Fionn’s Ladder at <http://en.wikipedia.org/wiki/In_Lebor_Ogaim>; and, Searles O'Dubhain’s very interesting website devoted to the musical resonances of Ogham, and the musical training of the Druids at <http://www.summerlands.com/crossroads/library/celticmu.htm> “Fionn’s Ladder” is one of the 100 "scales" of diverse cryptic varieties of written Ogham contained within the Book of Ballymote in the text known as In Lebor Ogaim (‘The Book of Ogams’), or the Ogam Tract. We note that the word scale is derived from the Latin scala, meaning ‘ladder’. 62. This illustration is based upon notched Ogham alphabets reproduced in R. A. S. Macalister, The Archaeology of Ireland, op. cit., p. 329, and in Robert Graves, The White Goddess: A Historical Grammar of Poetic Myth, op. cit., p. 114. 63. First, in The Archaeology of Ireland in 1928, and again, in 1937 in The Secret Languages of Ireland, whose first chapter is devoted entirely to Ogham. See: Chapter 1, “Ogham”, pp. 1-36. 64. R. A. S. Macalister, The Archaeology of Ireland, op. cit., p. 328. 65. R. A. Stewart Macalister, The Secret Languages of Ireland, op. cit., p. 1. An impressive collection of Classical authors, Caesar among them, who wrote little bits and pieces about the Druids is collected, mostly in condensed form, by John Matthews in The Druid Source Book, op. cit., pp. 15-25. 66. See: Gaius Julius Caesar, De Bello Gallico, VI.14. 67. See: R. A. S. Macalister, The Archaeology of Ireland, op. cit., p. 343. 69. Caesar, The Conquest of Gaul. S. A. Handford, Trans., 1951, Jane F. Gardner, Revision, 1982 (New York: Penguin Books USA Inc., 1982), Book VI.14, p. 141. 70. R. A. S. Macalister, The Archaeology of Ireland, op. cit., p. 328. 71. Ibid. ; and R. A. Stewart Macalister, The Secret Languages of Ireland, op. cit., pp. 5-6, where he deals with this subject at some length; and Ibid. p. 20, where Macalister discusses striking phonetic similarities between the Sanskrit Devanagari script and the Ogham alphabet. 72. R. A. S. Macalister, The Archaeology of Ireland, op. cit., pp. 333-34. 73. Lama Anagarika Govinda, Foundations of Tibetan Mysticism: According to the Esoteric Teachings of the Great Mantra Om Mani Padme Hum. (York Beach, ME: Red Wheel/Weiser, LLC, 1969), p. 22. 75. Wolfram von Eschenbach, Parzival: A Romance of the Middle Ages. Translated and with an Introduction by Helen M. Mustard and Charles E. Passage. (New York: Alfred A. Knopf, Inc., and Random House, Inc., Vintage Books Edition, 1961), Intro., p. xi. 76. Ibid., Intro., p. xix; and Book II, p. 65. 77. R. A. S. Macalister, The Archaeology of Ireland, op. cit., p. 337. 84. See: R. A. Stewart Macalister, The Secret Languages of Ireland, op. cit., Chapter 1, “Ogham”, pp. 6-8. 86. Robert Graves, The White Goddess: A Historical Grammar of Poetic Myth, op. cit., p. 23. 87. Steve Blamires, Celtic Tree Mysteries: Secrets of the Ogham. (St. Paul, MN: Llewellyn Publications, 1997), p. 12, translating the quotation from the Book of Ballymote. The author discusses Ogham, Oghma and his Gaulish equivalent, Ogmios, on pp. 12-16. 89. R. A. S. Macalister, The Archaeology of Ireland, op. cit., p. 329. 93. Although there are certain points in her article with which we disagree, some of which are enumerated here, shamanic practitioner, Caitlin Matthews, presents an illuminating discussion of the Druidic mantic arts in “The Celtic Art of Divination”, which is a section in Chapter 8, “Prophecy and Divination”, in Caitlin and John Matthews, The Encyclopedia of Celtic Wisdom: A Celtic Shaman’s Sourcebook, op. cit., pp. 250-51, and pp. 240-253 passim. 94. Robert Graves, The White Goddess: A Historical Grammar of Poetic Myth, op. cit., p. 198. Italics mine. 95. R. A. Stewart Macalister, The Secret Languages of Ireland, op. cit., p. 19. 96. Robert Graves, The White Goddess: A Historical Grammar of Poetic Myth, op. cit., p. 114, referring to R. A. Stewart Macalister, The Secret Languages of Ireland, op. cit., although neither text nor page is cited by Graves. 98. Robert Graves, The White Goddess: A Historical Grammar of Poetic Myth, op. cit., p. 114. 101. Ecclesiastes 3:1. King James Version. 102. The entire outlined contents of this complex calendar appear in Appendix I at the end of the Notes to this article. 103. R. A. Stewart Macalister, The Secret Languages of Ireland, op. cit., p. 20. 104. Robert Graves, The White Goddess: A Historical Grammar of Poetic Myth, op. cit., p. 167. 106. Barbara G. Walker, The Secrets of the Tarot: Origins, History, and Symbolism. (San Francisco: Harper & Row Publishers, 1984), p. 15. 107. For a brilliant discussion of this place in sacred time and space, see: Alwyn and Brinley Rees, Celtic Heritage: Ancient Tradition in Ireland and Wales. (London: Thames and Hudson, 1961), pp. 345-46. 108. Robert Graves, The White Goddess: A Historical Grammar of Poetic Myth, op. cit., p. 185. 113. Ibid. This paraphrasing of Robert Chambers is from his entry for December 25th, Vol. II, p. 745, and pp. 744-46, passim. Chambers, who was one of the most illustrious and most obsessively accurate chroniclers of such things, compiled his magnificent Book of Days from eye-witness observations and accounts previously recorded by many thousands of people over many centuries, and additionally, from an impressive roster of impeccable sources, not the least of which was William Shakespeare. See: R. Chambers, Editor. The Book of Days: A Miscellany of Popular Antiquities in Connection With the Calendar. Two Volumes. (London and Edinburgh: W. & R. Chambers, 1862-1864.) Republished in its entirety, with a new Introduction by Tristram Potter Coffin. (Detroit: Omnigraphics, Inc., 1990). 114. W. Carew Hazlitt, Faiths and Folklore Of the British Isles: A Descriptive and Historical Dictionary . . . . , op. cit., “Mistletoe”, Vol. II, p. 413, and pp. 412-13, passim. 115. Ibid. Another mistletoe-cutting ritual, this one, of great pomp and ceremony, which included the sacrifice of two white bulls, is said to have been celebrated about six weeks after the New Year at the rising of the new moon of February at about the time of Candlemas (Imbolc). This is the rite which is recorded in Pliny the Elder’s first century C.E. Natural History, or Naturalis Historiae, XVI, 95. The Druids’s deep and abiding association with the mistletoe is remembered in the famous image of the Druid priests cutting the mistletoe from its parent oak with a golden moon-shaped sickle. 116. Gertrude Jobes, Dictionary of Mythology Folklore and Symbols. (New York: The Scarecrow Press, Inc., 1962,) “alphabet, Druidic”, Part 1, p. 75. She identifies this day as falling on December 23rd, but, of course, the dating of the extra day is entirely dependent upon the date on which the Winter Solstice falls in any particular year. 117. Alwyn and Brinley Rees, Celtic Heritage: Ancient Tradition in Ireland and Wales, op. cit., p. 345. 118. Gertrude Jobes, Dictionary of Mythology Folklore and Symbols, op. cit., “mistletoe”, Part 2, p. 1111. 120. Gertrude Jobes, Dictionary of Mythology Folklore and Symbols, op. cit., “mistletoe”, Part 2, p. 1111. 122. Robert Graves, The White Goddess: A Historical Grammar of Poetic Myth, op. cit., p. 192. 123. For an in-depth discussion of these issues, see: Rupert Gleadow, The Origin of the Zodiac. (New York: Castle Books, 1968). 124. Lewis Spence, The Magic Arts in Celtic Britain, op. cit., p. 35. 125. Stuart R. Kaplan, The Encyclopedia of Tarot, op. cit., Vol. II, p. 383, illus., p. 382. 126. Robert Graves, The White Goddess: A Historical Grammar of Poetic Myth, op. cit., p. 192. 128. William Shakespeare, Twelfth-Night; or, What You Will, III.iv.54. 129. Robert Graves, The White Goddess: A Historical Grammar of Poetic Myth, op. cit., p. 179. 132. Steve Blamires, Celtic Tree Mysteries: Secrets of the Ogham. op. cit., p. 41, and pp. 41-42, passim. See also, Robert Graves, The White Goddess: A Historical Grammar of Poetic Myth, op. cit., p. 180. 133. Robert Graves, The White Goddess: A Historical Grammar of Poetic Myth, op. cit., p. 193. 135. Ibid., pp. 193-94 passim. 136. See: W. Carew Hazlitt, Faiths and Folklore Of the British Isles: A Descriptive and Historical Dictionary . . . . , op. cit., “Yew”, Vol. II, pp. 668-670 passim. 137. A Dictionary of Plant-Lore. Roy Vickery, Compiler, op. cit., “Yew”, p. 411, quoting Label at the Royal Botanic Gardens, Kew, Surrey, October 1993. 138. See: W. Carew Hazlitt, Faiths and Folklore Of the British Isles: A Descriptive and Historical Dictionary . . . , op. cit., “Yew”, Vol. II, pp. 668-670 passim. 139. See: A very informative article by Geoff Boswell, “Notes on The Yew: Taxus baccata As Honoured By the Druidic Order of the Yew” at <http://druidnetwork.org/articles/theyew.html> He mentions the poisoning of the arrow tips, as does Graves, who gives the actual recipe! See: Robert Graves, The White Goddess: A Historical Grammar of Poetic Myth, op. cit., p. 194. 140. Anne Ross, Pagan Celtic Britain: Studies in Iconography and Tradition. (Chicago: Academy Chicago Publishers, 1996; Originally published in 1967), p. 305. 142. Alwyn and Brinley Rees, Celtic Heritage: Ancient Tradition in Ireland and Wales, op. cit., p. 83. For a lucid explanation of the two divisions of the old year, see also pp. 83-89, passim. 145. See: Prudence Jones and Nigel Pennick, A History of Pagan Europe. (New York: Barnes & Noble Books, 1999), p. 91, and pp. 89-91 passim. 146. For an in-depth discussion of the dating of this early Irish story, see: Anne Ross, Pagan Celtic Britain: Studies in Iconography and Tradition, op. cit., p. 305. 147. See: Ibid., pp. 302-311 passim. 153. See: Walter Yeeling Evans-Wentz, The Fairy-Faith in Celtic Countries. (New Hyde Park, NY: University Books, Inc., First Printing, June 1966, First published in this form by Oxford University, 1911), pp. 409-26. 154. See: Martin Brennan, The Stones of Time: Calendars, Sundials, and Stone Chambers of Ancient Ireland. (Rochester, VT: Inner Traditions International, 1994), pp. 18-23. 158. The Homeric Hymn to Hermes, in Hesiod The Homeric Hymns and Homerica. Hugh G. Evelyn-White, Trans. (Cambridge, MA: Harvard University Press, The Loeb Classical Library, 1914-1954), pp. 362-405. 159. Ibid., line 526, p. 401. 160. Ibid., lines 534-35, p. 403. 162. Robert Graves, The White Goddess: A Historical Grammar of Poetic Myth, op. cit., p. 196. 163. Caesar, The Conquest of Gaul, op. cit., Book VI.17, p. 142. 166. Karl Kerenyi, Hermes: Guide of Souls: The Mythologem of the Masculine Source of Life. Murray Stein, Trans. (Zurich: Spring Publications, 1976), p. 88. 167. Steve Blamires, Celtic Tree Mysteries: Secrets of the Ogham, op. cit., pp. 15-16, directly quoting Lucian of Samosata, an Assyrian satirist who was traveling in Gaul in the 2nd century C.E. 170. Thomas Barns, “Trees and Plants”, in Encyclopaedia of Religion and Ethics. James Hastings, Ed. 12 Volumes + Index. (New York, Charles Scribner’s Sons, no date, c. 1912), p. 456, and pp. 448-457 passim. 171. Steve Blamires, Celtic Tree Mysteries: Secrets of the Ogham, op. cit., p. 12, translating the quotation from the Book of Ballymote. 172. James MacKillop, Dictionary of Celtic Mythology, op. cit., “Ogma, Oghma, Ogmae, Ogme”, p. 310. One of Ogma’s epithets is Cermait, or ‘Honey-Mouthed’. 173. For a detailed discussion of Brigid’s roles, see: Tracy Boyd, “The Keepers of the Flame: Part II. Brigid’s Fires of Beginning” under the heading: “Illuminating Brigid’s Fires” at <www.sacredthreads.net>. 174. Lewis Spence, The Magic Arts in Celtic Britain, op. cit., pp. 60-61. 175. For more on this spell-binding subject and the results of such curses, see: Tracy Boyd, “Titania, the Queen of Faerie, and the Druid Tom Thumbe” under the heading: “Fe, Fi, Fo, Fum . . .”; Tracy Boyd, “The Mythic Ground of the Longing for Wisdom and Love in William Butler Yeats’s The Song of Wandering Aengus” under the heading: “The Waters of the Left-Hand Path” at <www.sacredthreads.net>; Lewis Spence, The Encyclopedia of the Occult. (London: Bracken Books, 1994), “Celts”, p. 97; Lewis Spence, The Magic Arts in Celtic Britain, op. cit., pp. 60-61; and James MacKillop, Dictionary of Celtic Mythology, op. cit., “glam dicenn”, p. 224. 176. R. A. Stewart Macalister, The Secret Languages of Ireland, op. cit., p. 11. 177. Lewis Richard Farnell, The Cults of the Greek States. Five Volumes. (Chicago: Aegaean Press, Inc., MCMLXXI), Vol. 5, p. 22. 178. Karl Kerenyi, Hermes: Guide of Souls: The Mythologem of the Masculine Source of Life, op. cit., p. 44. 179. Rainer Maria Rilke, “The First Elegy”, in Duino Elegies. J. B. Leishman and Stephen Spender, Translation, Introduction, Commentary. (New York: W. W. Norton & Co., 1939, 1967), lines 77-84, p. 25. 180. The Way of Chuang Tzu. “Free interpretative readings” by Thomas Merton. (Boston: Shambhala Publications, Inc., 1992), pp. 112-113. “In My End Is My Beginning” is Merton’s title for Chuang Tzu’s “Heaven and Earth”, a literal translation of which is found in The Writings of Chuang Tzu, Book XII, Part II, Section VIII at <http://nothingistic.org/library/chuangtzu/toc.html> The original line: “In my beginning is my end.” is from T. S. Eliot, Four Quartets, “East Coker” I.1. We have preserved the more fully documented, and, we believe, correct, ‘B-L-F-S-N’ sequence in our interpretation of the Tarot Fool’s message. The order of the letter sequence of the sacrosanct vowels A-O-U-E-I, which is the main concern of our inquiry, remains unchanged in Graves’s “calendar of seasonal tree-magic.” In point of fact, the thirteen lunisolar months repre-sented by the thirteen consonants are meant to be separated from the vowels, standing alone in their own sequential order to represent the full circle of the year. The calendar presented here is that of Robert Graves’s alone. It is a creation based entirely upon the scholarship and vision of this illumined poet. The associations that he has assigned to the stations of the year, their tree-letters, and calendrical occurrences, are enumerated in precise detail in The White Goddess: A Historical Grammar of Poetic Myth. (4) We have gathered the abundance of wisdom presented there and laid out his Tree Alphabet Calendar in a more understandable list form. In addition, we have taken the very unorthodox liberty of grouping the vowels and consonants together as they occur in their proper seasonal order so that an immediate gestalt of the year can be seen in true perspective. AILM (DECEMBER 23) THE EXTRA DAY, THE BRIDGE BETWEEN THE LAST AND FIRST DAYS OF THE YEAR OF THE WINTER SOLSTICE; THE EVE OF THE BIRTH OF THE DIVINE CHILD, OR NEW YEAR KING. THE VOWEL-TREE REPRESENTING THIS SHORTEST DAY OF THE YEAR IS THE SILVER FIR, THE BIRTH-TREE OF THE MOON-GODDESS. Beth Dec. 24-Jan. 20. The Birch of parthenogenic beginnings. Luis Jan. 21-Feb. 17. The Rowan Tree of Life. Nion Feb. 18-Mar. 17. The water-loving Ash. ONN (MARCH 21) THE FURZE-TREE FIRES OF THE VERNAL EQUINOX BURN BRIGHTLY IN THE LAND AS THE CLOCKWISE JOURNEY OF THE SUN-KING REACHES ITS MIDPOINT BETWEEN DAY AND NIGHT, BETWEEN LIFE AND DEATH. Fearn Mar. 18-Apr. 14. The fire-loving Alder. Saille Apr. 15-May 12. The Willow Queen of the Underworld. URA (JUNE 24) THE HEATHER OF THE WASTELAND BELONGS TO THE GODDESS OF LOVE WHO RULES THE MIDSUMMER NEW YEAR’S DAY OF THE SUMMER SOLSTICE. SHE IS THE HINGE, THE PIVOTAL POINT OF THE DOOR OF THE YEAR, WHICH SHE SWINGS CLOSED AT MID-MONTH WITH THE KILLING OF THE OAK KING ON THIS LONGEST DAY OF THE YEAR. THE HOLLY KING DOES HER BIDDING, AND THUS BEGINS THE WANING YEAR OVER WHICH THE HOLLY KING REIGNS. Tinne July 8-Aug. 4. The New Year Holly King. Coll Aug. 5-Sept. 1. The Hazel Tree of Wisdom. Muin Sept. 2-Sept. 29. The Vine of Exhilarating Joy. EADHA (SEPTEMBER 23) THE WHITE POPLAR, OR ASPEN TREE OFFERS HOPE FOR THE DEAD AS THE COUNTER-CLOCKWISE JOURNEY OF THE SUN-KING REACHES ITS TURN AT THE AUTUMNAL EQUINOX, THE MIDPOINT BETWEEN DAY AND NIGHT, BETWEEN LIFE AND DEATH. Gort Sept. 30-Oct. 27. The Dionysian Ivy of Intoxicating Resurrection. Ngetal Oct. 28-Nov. 24. The Dwarf-Elder, or Reed Scepter of Kingship. Ruis Nov. 25-Dec. 22. The Elder Tree of Crucifixion, Doom & Death. 1. Robert Graves, The White Goddess: A Historical Grammar of Poetic Myth. (New York: Farrar, Straus and Giroux, 1974; 7th Printing of Amended and Enlarged Edition of 1966), p. 165. 3. For a thorough discussion of this issue, see: Steve Blamires, Celtic Tree Mysteries: Secrets of the Ogham. (St. Paul, MN. : Llewellyn Publications, 1997), p. 39. 4. Robert Graves’s datings and symbolic interpretations are to be found in great detail in: Robert Graves, The White Goddess: A Historical Grammar of Poetic Myth, op. cit., pp. 165-194.